Not that I didn’t already know this information. Not that I didn’t realize I lead a dull and mundane life. Wake up. Go to work. Come home. Do laundry. Many people suffer this condition of humdrumness. I’ve done my share of rudimentary travel. I’ve been places. We go on vacation. I’m from an interesting and diverse city. But still there isn’t much to report in regards to my daily life. I used to have a good time. Then I don’t know what happened. Life ate my life. This really has been a non-issue for me until lately. I’m suddenly having a desire to be much cooler than I’ve ever been, or ever cared about being. I have this fantasy of late, me being the disquieted, restless writer alone in her room overwrought from my attempts to create the perfect characters and scenes and using fresh, original imagery. My hair mussed from my running my fingers through it as I sit at the keyboard staring at the screen wracking my brain for just the right words. Random papers on my desk whip into the air and do somersaults before fluttering to the ground because I keep the floor length windows of my Caribbean home open to the warm, salty breeze. Ok. My imaginary life is much more imaginative than my real life. Maybe I’m just having a mid-life crisis a little early. My hair is usually mussed, though. There’s a start. And I don’t drink Dos Equis. I do drink Michelob Ultra. And Budweiser. I enjoy memes. Good time-wasting material. Entertaining. The newest meme blasting my Facebook feed is the How People View Me meme. 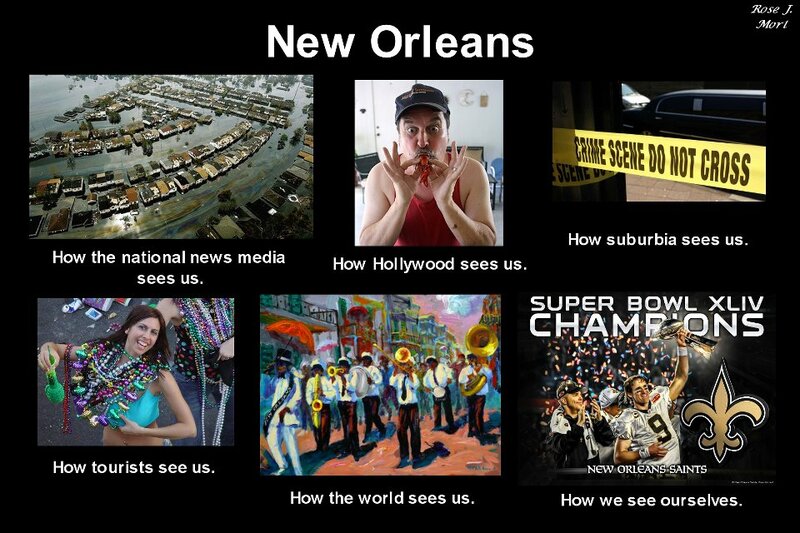 I’ve seen many that are inaccurate, but I had to share a quick post of the following New Orleans meme because it is so true and it made my day. Enjoy!